All cookware should come in 2-in-1 form. What has worked so well for pizza toppings can easily be incorporated into other dishes. Take for example, this 2-in-1 Hot Pot (11-in.) by Tayama. Perfectly designed with a slightly off-center divider (one flavor is bound to be more popular), the hot pot makes it easy for diners to not only choose their own meats and vegetables, but what to dip them into too. With one side filled with a spicy stock (the larger side of course), and the other not so spicy, eaters are given a choice aimed to please particular palates. Be careful which side you fill up with the good stuff though; you don’t want to be left with an abundance of anchovy-ham-pineapple stew. Any good road trip requires road food. Perhaps when the tires hit the asphalt it’s just an excuse to devour foods of questionable sustenance. After all, it’s not too likely you’re gonna find healthy food on the off-ramp. If you don’t have any road trips planned this summer, you’re going to need another excuse to pile on the calories. 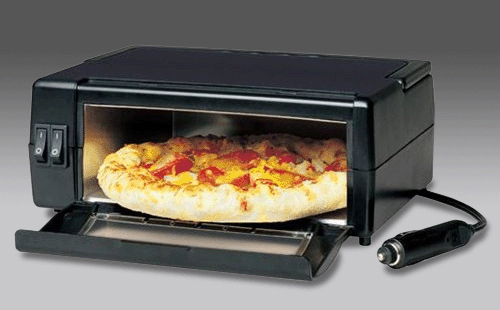 Having an oven in the car designed to cook pizza would certainly supply that excuse. The Porta-Pizza Oven is powered via your car’s 12V jack. The minimal controls (presumably for safety’s sake) provide a high and low setting for cooking or warming. 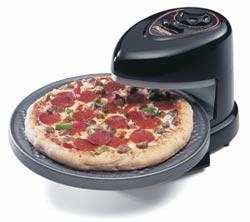 Whether or not this oven will actually cook a pizza during your commute is irrelevant. What does matter, however, is that armed with a pizza oven, you’re simply going to have to find out. Remember: when pizza’s on the dashboard, you can eat pizza any time. You know how square watermelons (for some reason) sell for close to one hundred dollars in Japan? Well, now you can get in on the ground floor for the next big craze: fanciful cucumber design. Tap into your entrepreneurial spirit with Heart Shaped Cucumber Molds. Working the same way as the aforementioned ovally-challenged watermelons, simply place your young cucumber into the device and let Mother Nature run its course. (Constricted by this contraption, that is.) When it’s time to harvest, remove the sleeve, and it’s off to market you go! Like many others, I find myself using appliances and tools for tasks that they are not designed for. Be it a screwdriver as a hammer or a fork as a knife, there are hidden uses lurking in all of our hand tools. Sometimes, they are not so hidden. 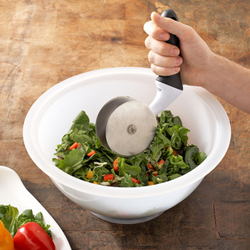 This Salad Chopper and Bowl from OXO looks to me like it has a second, more useful application. Sure the bowl is great, but I can’t really see myself chopping vegetables inside of it. Some pieces would end up too big, some too small, and all of them oddly shaped. Instead, I’ll choose to chop my salad the old-fashioned way, and serve with pizza strips that could only be cut from such an original salad pizza chopper.